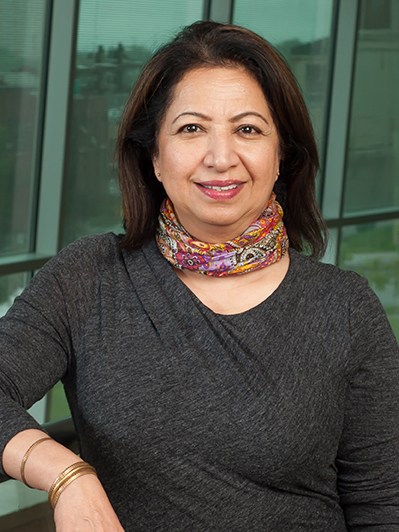 UNMC › Pharmacology › Faculty & Staff › Primary Faculty › Shilpa Buch, Ph.D. Under the Microscope: UNMC Scientist Laureate Shilpa Buch, Ph.D.
Dr. Buch in her own words. Infection with HIV-1 is frequently complicated in its late stages by a neurological syndrome, HIV-associated dementia (HAD), clinically characterized by abnormalities in cognition, motor performance, and behavior. While the exact mechanism(s) by which HIV-1 causes CNS pathology are not completely understood, increasing evidence suggests that a state of immune activation associated with increased levels of pro-inflammatory cytokines is an important factor contributing to neuronal damage. These pro-inflammatory cytokines can, in turn, synergize with the viral proteins released from HIV-infected cells to generate neurotoxins resulting in progressive neuronal damage associated with HAD. Interestingly, it is becoming increasingly clear that although the initial trigger of HAD is the virus, the severity of the disease correlates more closely with the presence of activated cells than with the presence and amount of HIV-infected cells in the brain. Despite the preponderance of HIV for macrophages and CD4+T cells, virtually all the resident cells of the CNS are players contributing to the disease process. To date, several aspects of HAD pathogenesis remain to be dissected. Using a multipronged approach comprising of in vitro cell systems, complemented with rodent models and the higher more relevant macaque model of SIV pathogenesis, and archival human tissue, our research aims to dissect the mechanism(s) of CNS pathology triggered by the host-virus interplay. Specifically, we are interested in the role of each CNS cell type as it contributes cumulatively to the disease process. The Chemokine Connection: CXCL10 or interferon γ-inducible peptide has been detected in the CSF of individuals with HIV-1 infection and is closely associated with the progression of HIV-1 related CNS infection and neuropsychiatric impairment. Using the macaque model of HIV neuropathogenesis, we have identified the role of this chemokine as a potent neurotoxin that is linked to virus-associated encephalitis. Specifically, we have demonstrated the signaling pathways by which viral proteins cause regulated induction of this chemokine, thereby resulting in apoptotic cell death. Additionally, papers from our laboratory suggest that in astrocytes, the interplay of viral proteins with the inflammatory mediators (IFN-γ/TNF-α) can lead to synergistic induction of this neurotoxin, via the oxidative stress pathway. Endogenous Neuroprotective Pathways: CNS homeostasis is a fine balance of neuroprotective and neurotoxic pathways. However, this can be a double-edged sword, as a well-intentioned protective response, if extended for a long time, can go awry. We have been interested in exploring endogenous cellular pathways that can augment neuronal survival. In our recent findings we report unconventional role for the HAD-associated chemokine, MCP-1 - that of neuroprotection against virus toxicity. Similarly, we have also reported the paradoxical role of platelet-derived growth factor as a neuroprotective factor against HIV toxicity. These are very intriguing findings as they lend credence to the existence of selective "anatomical niches" in the CNS. Our ultimate goal is to examine the roles of these host mediators as therapeutic agents that can mitigate CNS inflammation and impaired synaptic transmission in vivo. Drugs of Abuse and HIV Co-operativity: Injection drug abuse is a major cause of the spread of HIV/AIDS. Heroin, morphine and other opioids not only promote HIV infection and the progression of AIDS, but also appear to intrinsically exacerbate the frequency and severity of HIV encephalitis (HIVE) in the CNS. We are actively pursuing how cocaine synergizes with HIV/HIV proteins to exacerbate disease pathogenesis. Our findings imply that that cocaine can act at multiple steps within the CNS to promote neuronal toxicity, specifically impacting the blood brain barrier breach and enhancing virus replication in macrophages. Another highly relevant area of research in our lab is aimed at examining the effect of morphine on progression of HIVE in SIV-infected macaques, which are an excellent analog of HIV encephalopathy. HIV, aging and NeuroAIDS: The now chronic nature of HIV has led to a major advancement in AIDS care. While HIV infected individuals are living longer, damaging effects of HIV persist in the brain and may interact with other neurodegenerative disorders. Dr. Buch, along with dR. Howard Fox, leads the Chronic HIV infection and Aging in NeuroAIDS Center (CHAIN). The Center is supported by NIH, NIMH P30 MH062261. The goal of the CHAIN Center is to provide the necessary leadership and backbone of support to continue the outstanding research on HIV/AIDS, aging and the central nervous system ongoing at the University of Nebraska Medical Center and throughout the nation. Experts in a number of fields direct the Cell-Tissue-Animal, Imaging, Omics, and Therapeutics cores, along with the Administrative and Developmental cores. Visit the CHAIN Center web site for more information. The long term goal of our group is to identify novel therapeutic strategies that may enhance neuronal function and survival in NeuroAIDS, with possible implications in other neurodegenerative diseases.